MIRO, JOAN. (1893-1983). Catalan surrealist artist. ALS. (“Miró”). 1p. 4to. Son Abrines, N.d. (August, after 1956). 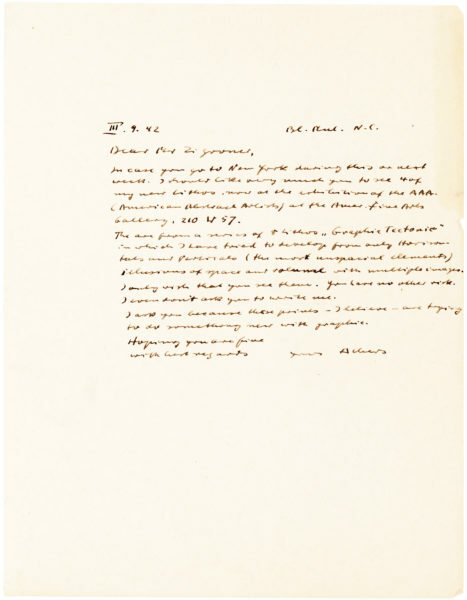 On his personal stationery. To Cuban lawyer, art critic and founding director of the Art Museum of the Americas JOSÉ GÓMEZ-SICRE (1916-1991). In Spanish with translation. “As you can see we now live in Mallorca where life is good and one can work peacefully. I’m sorry your friend couldn’t find me in Barcelona. A native of Barcelona, Miró was inspired by Fauvism and Impressionism to create his distinctive Surrealist works, which earned him international renown. His first solo exhibition was in 1918 and by the 1920s he was at the heart of the Surrealist movement, associating and collaborating with Max Ernst, André Breton and Fernand Mourlot. During the 1940s, Miró began his relationship with French art dealer Aime Maeght, an association which would become both a close friendship and an influential working collaboration. Our letter also mentions French-born, American art dealer Pierre Matisse (1900-1989), the youngest child of French artist Henri Matisse. A great mentor to promising artists, the younger Matisse exhibited Miró’s work in his gallery more than any other artist, staging 37 exhibitions between 1932 and 1985. 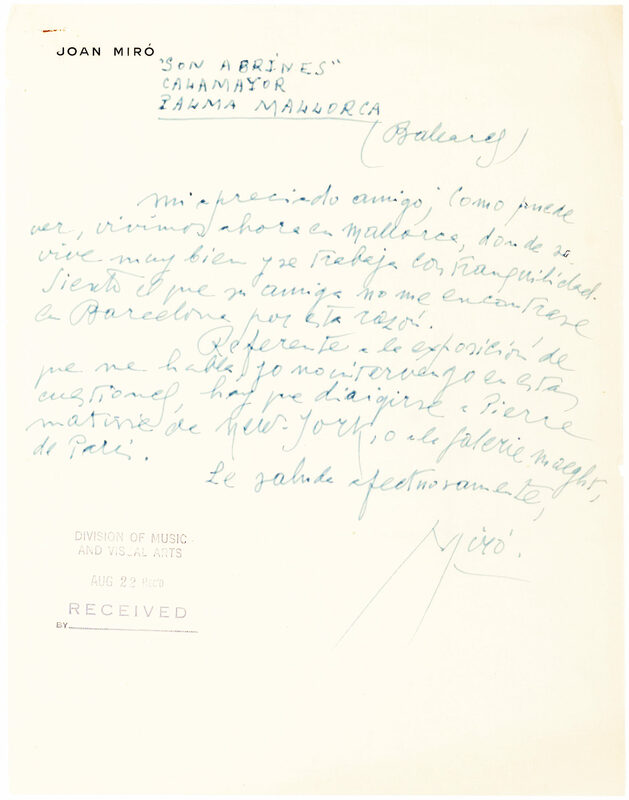 In 1934, Miró granted Matisse exclusive rights to selling his work in North America. Miró relocated to a farm, “Son Abrines,” near the Majorcan resort town of Cala Mayor, just outside of the capital city Palma de Mallorca in 1956. Both his mother and wife were natives of the island and it was there, in 1981, that he established his Miró Mallorca Foundation. 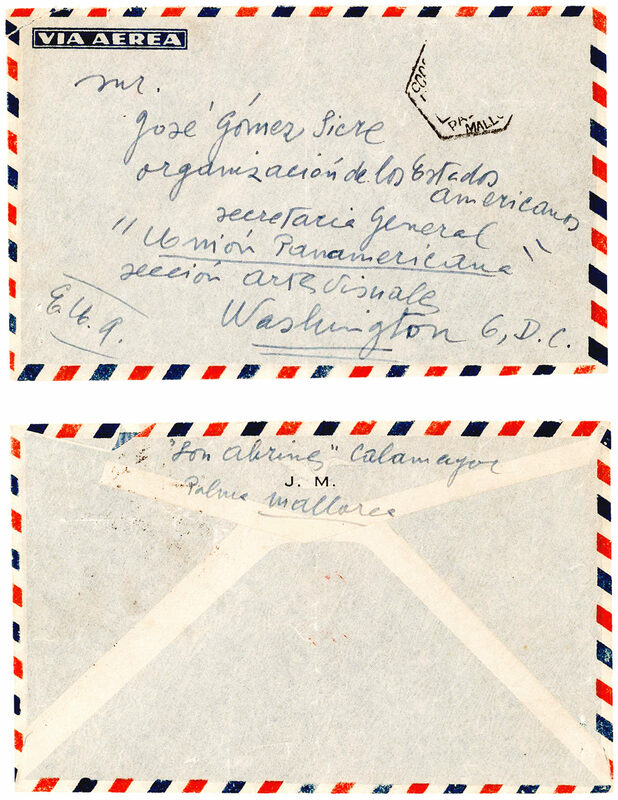 Beginning in 1946 and over the course of the next 50 years, Gómez-Sicre promoted the work of Latin American artists through the Pan-American Union (later the Organization of American States). In 1976, he was instrumental in the institution’s founding of Washington, D.C.’s Art Museum of the Americas, of which he became director. Additionally, he authored numerous books, articles and film scripts on the subject of Latin American art. 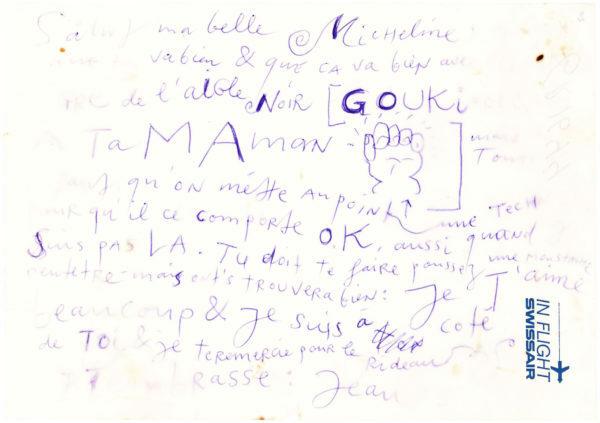 Flamboyantly signed in in Miró’s characteristic hand. Normal folding with a staple hole in the upper left corner. Bearing an ink docket stamp of the Division of Music and Visual Arts. 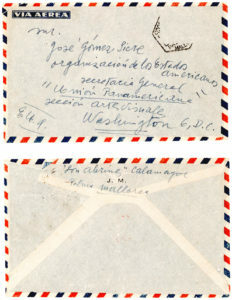 With Miró’s personal airmail envelope addressed in his hand. In fine condition.